For Malaysian and Singapore Chinese, it is a tradition that during Chinese New Year, cookies and other delicacies were being prepared for purposes of entertaining visitors. Families either bought ready made cookies, or as gifts from friends and relatives or prepare themselves. Usually, after the festival, lots of cookies were left untouched. For most family, it is practically impossible to finish all these cookies within a reasonable period of time and before the qualities were compromised. Most families resort to throwing away the cookies. Looking at the cookies that are sitting in my shelves and realizing it wouldn’t take long before it turns bad, I have decided to try baking the cookie pudding based on the principles of preparing the bread pudding. I started by layering my cookies (actually, everything that I found from marshmallow to titbits of my kids). I then prepare a liquid mixture of sugar, eggs, butter, and fresh milk . Pouring the liquid mixture over the biscuits or cookies layer by layer. I let it soaked for a while and used forks to press the mixtures until I am convinced that all the cookies were fully soaked. It should then be moist and soft. I then steamed baked the mixtures until set which took approximately 1 hour (Note: for this illustration, I did not use steam bake). 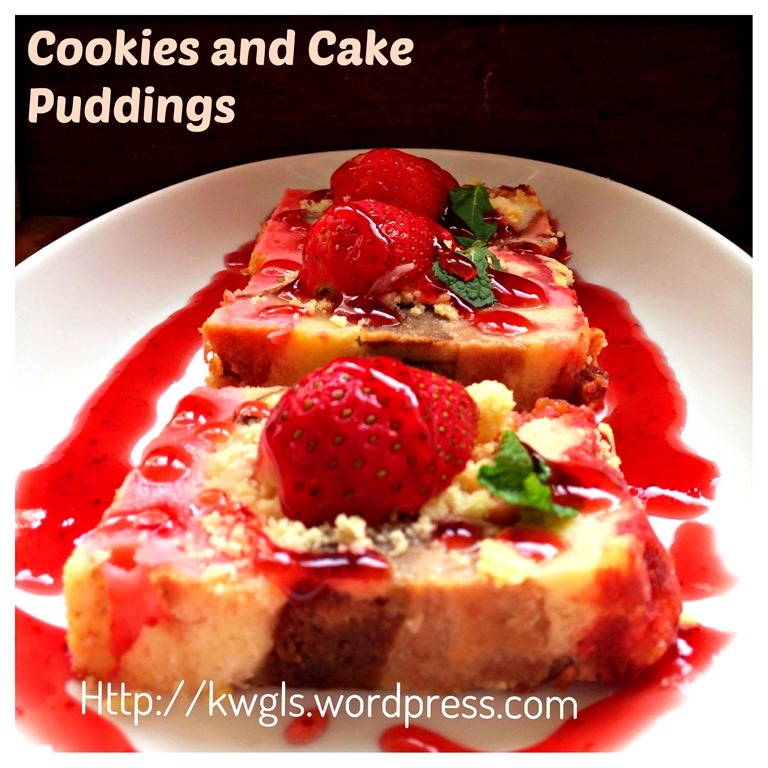 Finally, I have my cookie puddings that resemble the bread puddings. There is no exact recipe, it is of full flexibility. 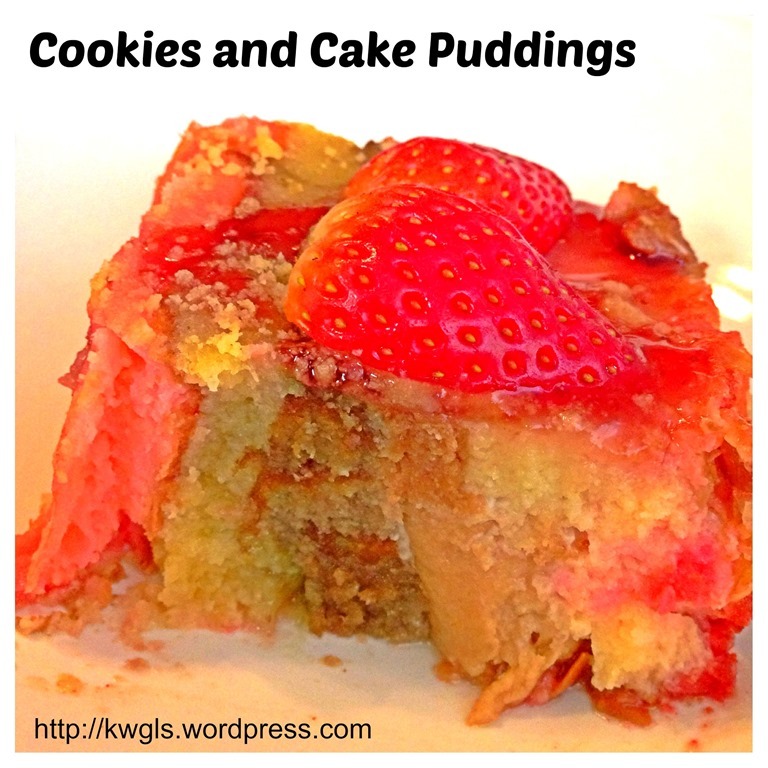 Due to the high fats and high sugars content of the cookies and cakes being served, generally, I did not add additional sugar and only a small quantity of melted butter (about 50 grams but it is optional) for smoothening the puddings. 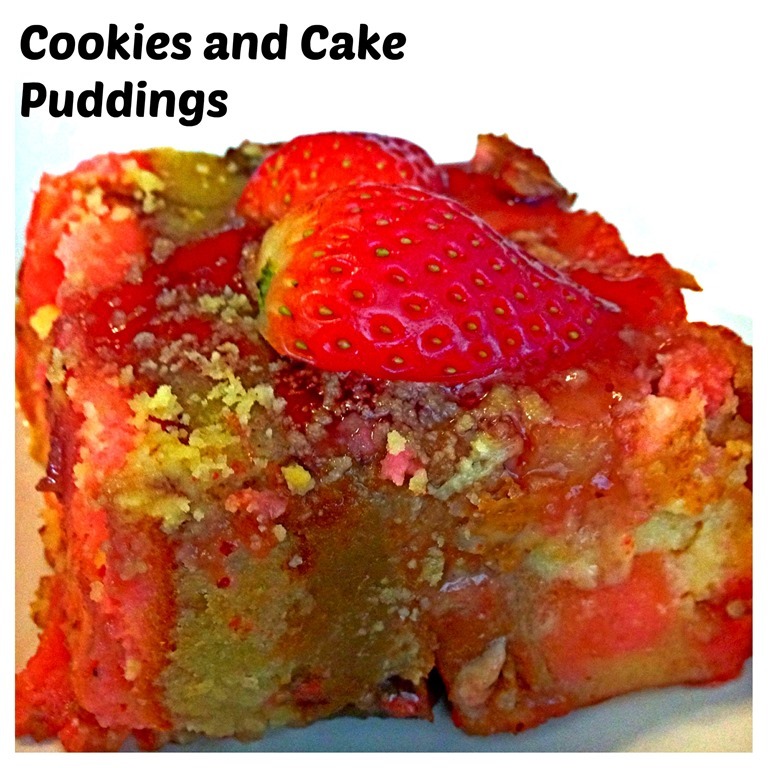 The taste will very much depends on the cake and cookies that you used. Cookies and cakes may be staled but not turning bad yet. They may not be crispy anymore. Chinese New Year seasons is over and your family is tired of having the same cookies for the past few weeks… Either you throw away and you put a small investment and turned it into another bake. The small investment is some eggs. 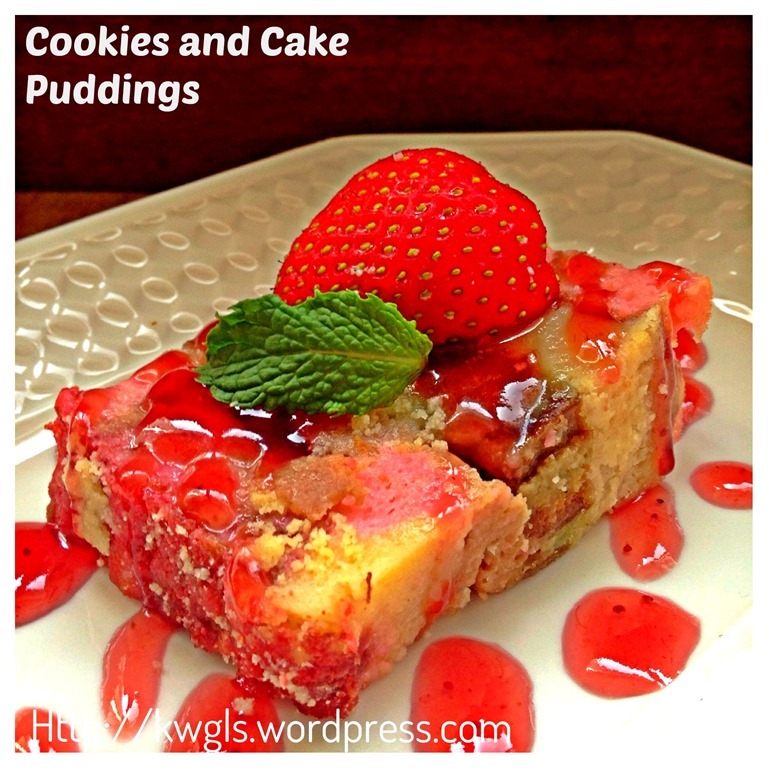 Even that, you can use some unused egg whites from making certain cakes before Chinese New Year and don’t know what to do with it… As long as there are eggs and milk (substitutable with plain water) and you can prepare this pudding. 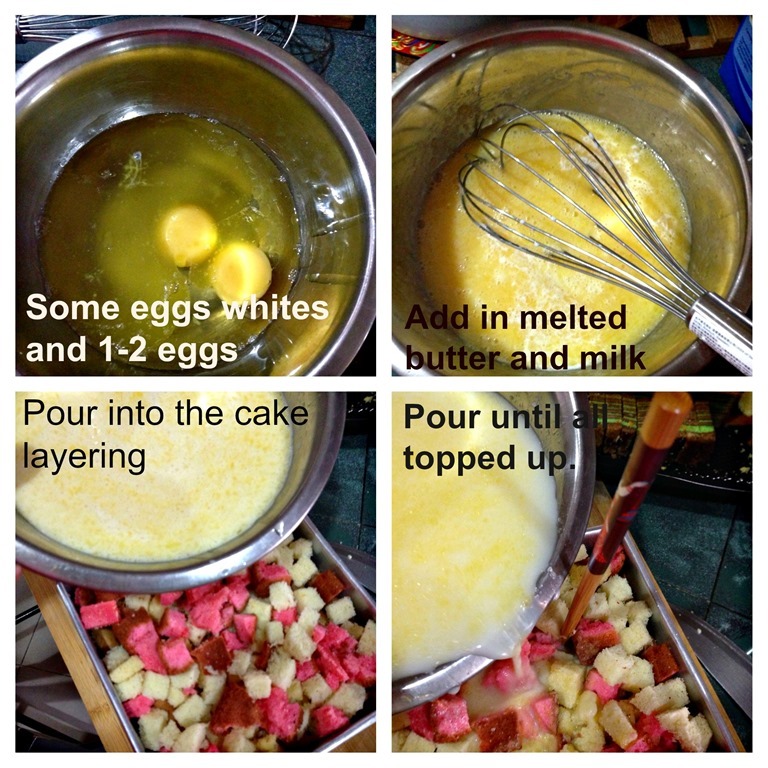 Eggs are necessary to make it a pudding like structure and act as a binding agent among the various materials. 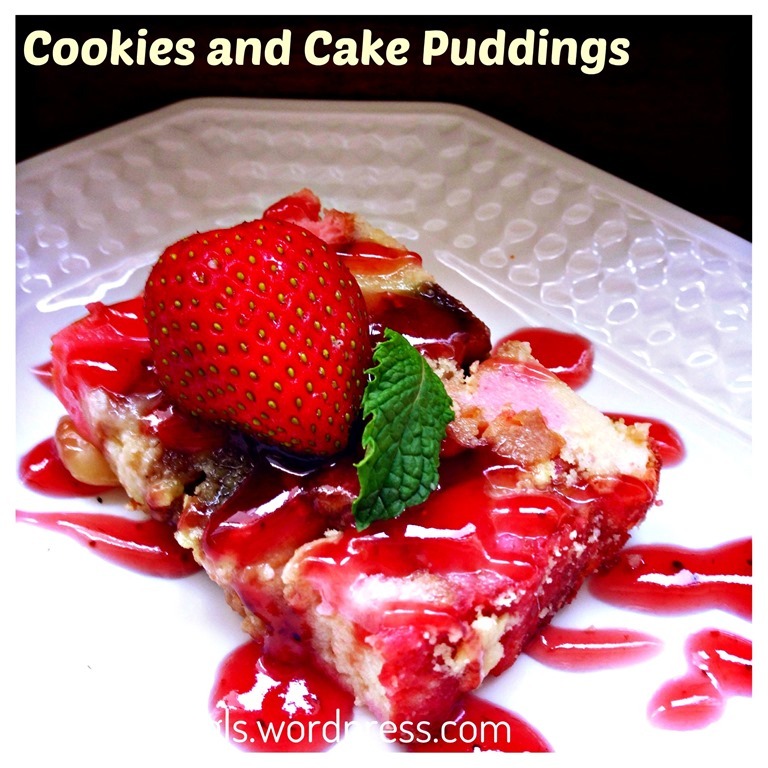 This is nothing new, it is just a simple concept applied to bread puddings. 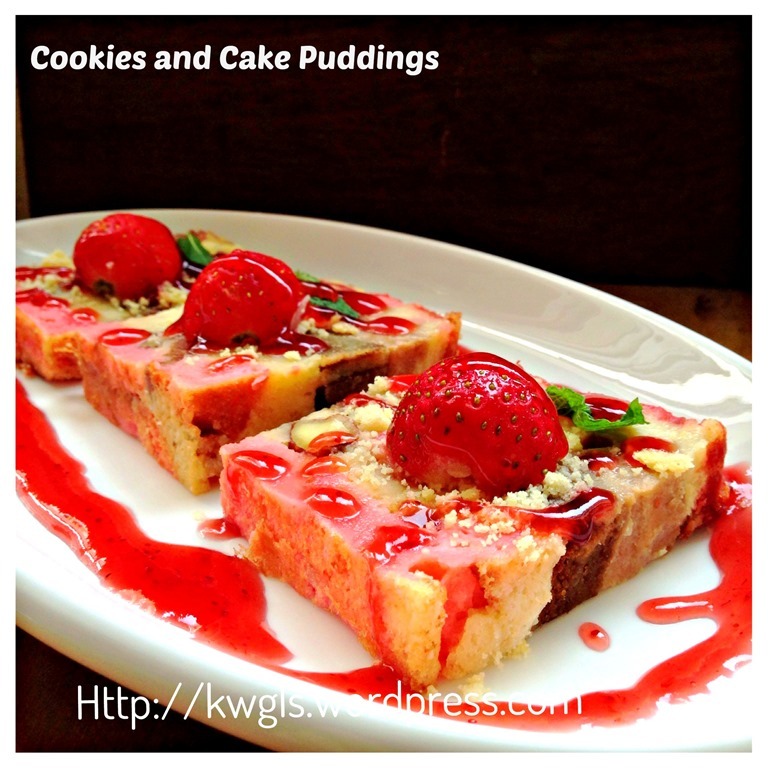 It is simpler than bread puddings as stale bread is tasteless but the cookies and cakes are already well flavoured. 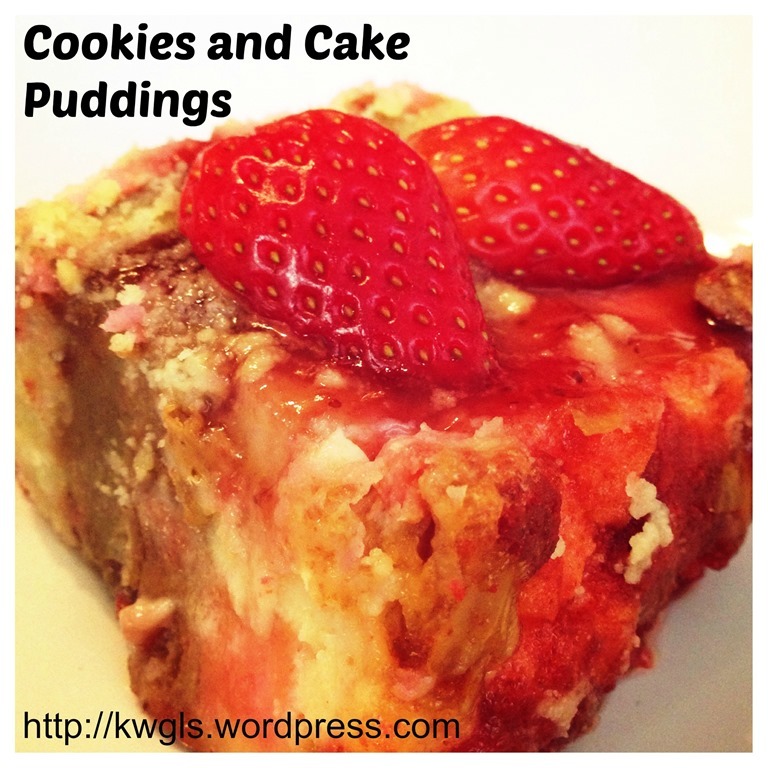 Remember, rubbish in rubbish out, quality staled cakes and cookies used (which I am sure most of your cookies and cakes at home are still edible), a quality cookies pudding will be produced.. 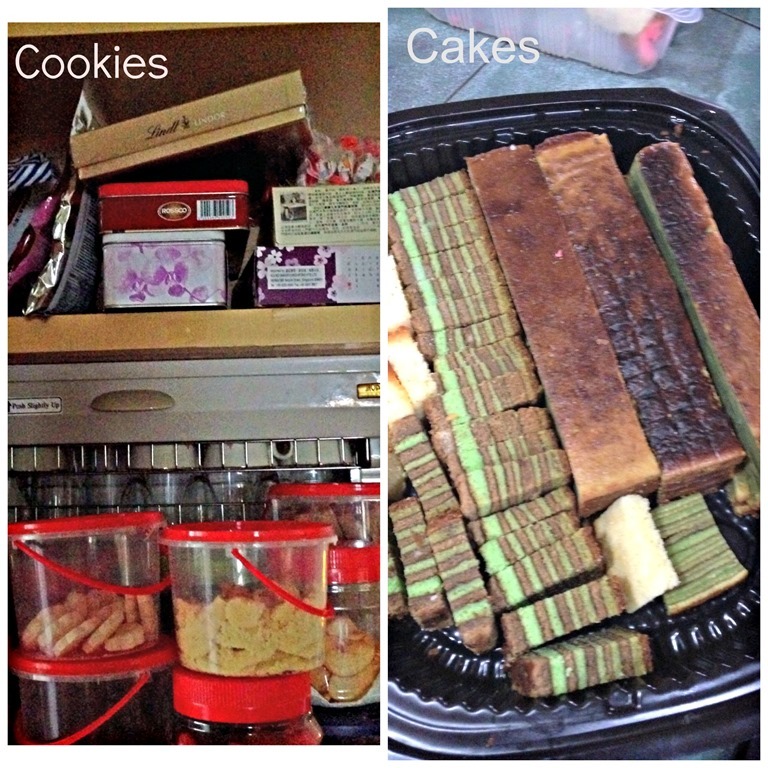 This is what I did for 2014 Chinese new year cookies and cakes to make the puddings. I have lots of cookies and cakes left.. including some that were not included here such as my Steamed sponge cake and strawberry egg white cake. I started greasing the tin and layer the pudding. Usually the first layer is cakes or bread for shaping purposes. 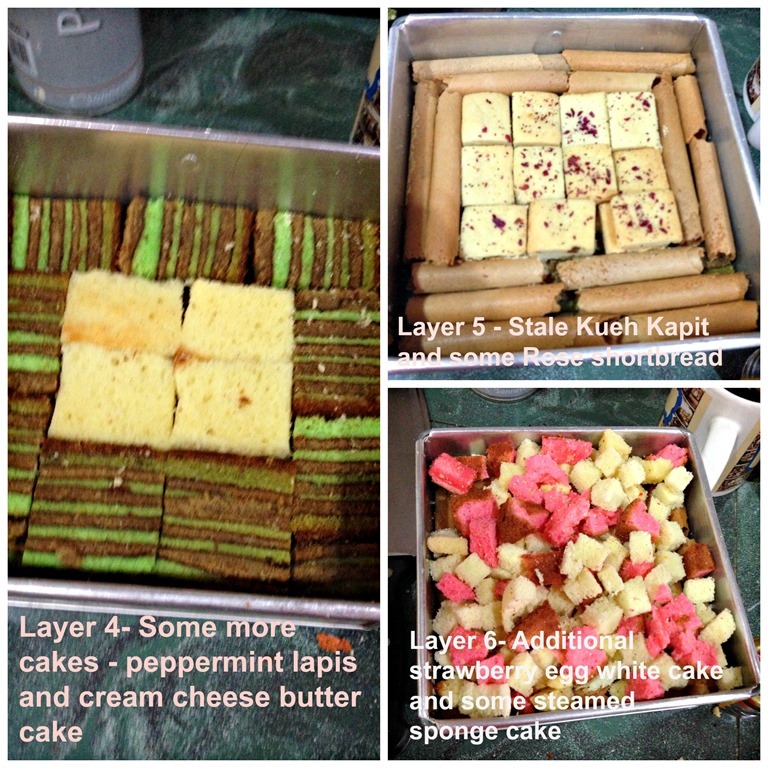 More variety of cakes and cookies were being added and filled the tin until full. (advisable to fill 90% full and I am too greedy in this illustration. It will expand when bake and shrink down after the eggs are set). I topped with additional red velvet cookies crumbles and some yellow colour ghee cookies (kueh momo) crumble. I then baked in the oven at 180 degree Celsius for about 30 minutes or until the puddings become set. 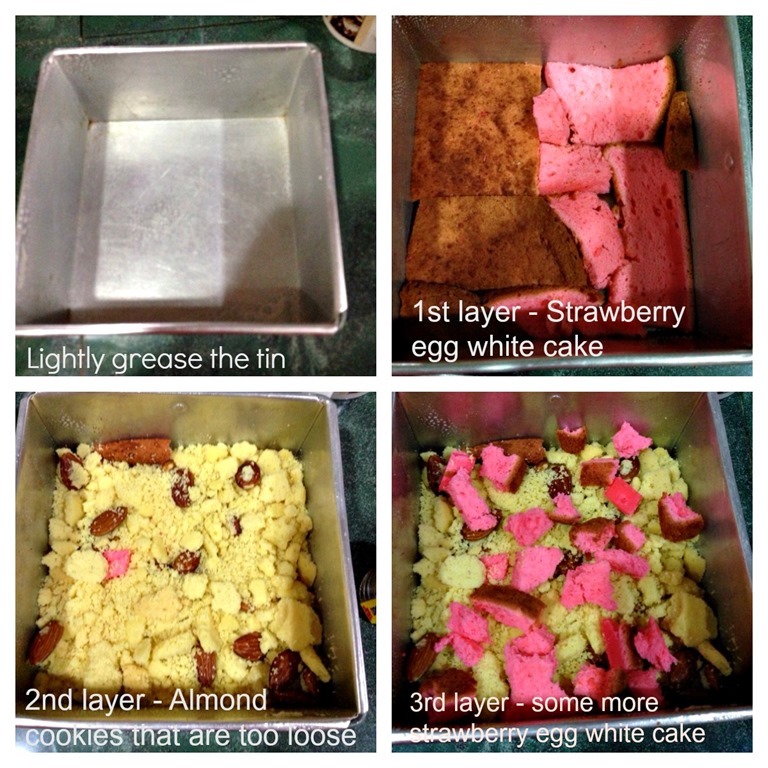 Set means the egg mixture starts to solidify and no wavy pattern in the mixture when you pushed the tin. I served with some fresh strawberry and strawberry sauce and I prefer to serve it cold. At times I served with milk or even ice creams. If you are a Pinterest user and you are interested to have more recipes, you can join or follow this Pinterest Board set up by me where there are more than 1000 recipes worldwide and pinned by various bloggers: FOOD BLOGGERS AND FOODIES UNITED PINTEREST BOARD. 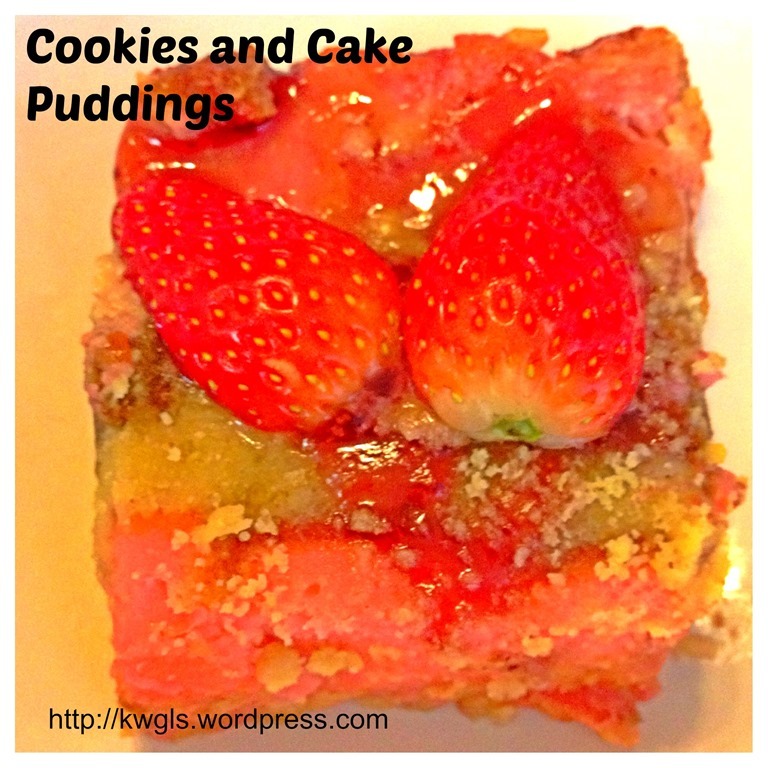 You can also join the Food Bloggers and Foodies United Group Facebook Group to see more recipes. 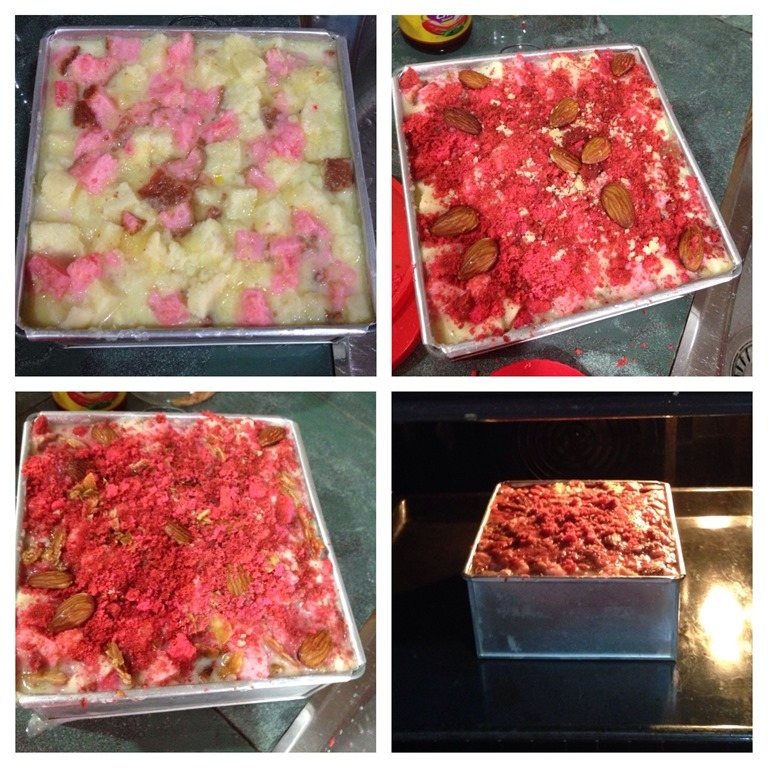 This entry was posted in Cakes and cookies, Chinese New Year 2014, Desserts, Food Preparation Series and tagged 8, bread puddings, Cake, cake puddings, Chinese New Year 2014, cookies and cake puddings, cookies puddings, GUAI SHU SHU, Guaishushu, kenneth goh, postaday. Bookmark the permalink. Love this idea, Ken! Genius! Thanks for linking up to Saturday Night Fever – pinning now! G’day! 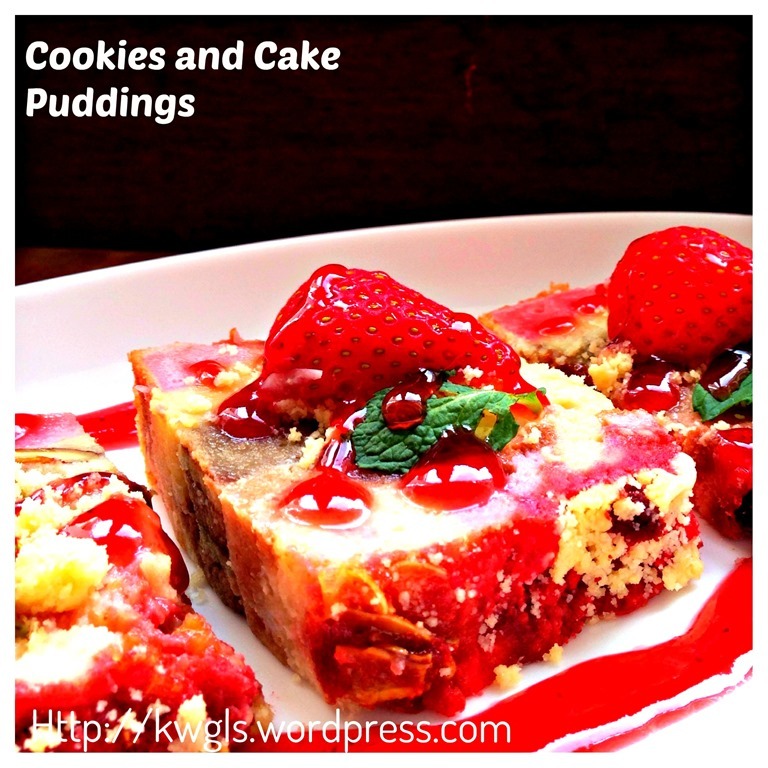 Quite interesting desserts! Great hints and tips Kenneth! 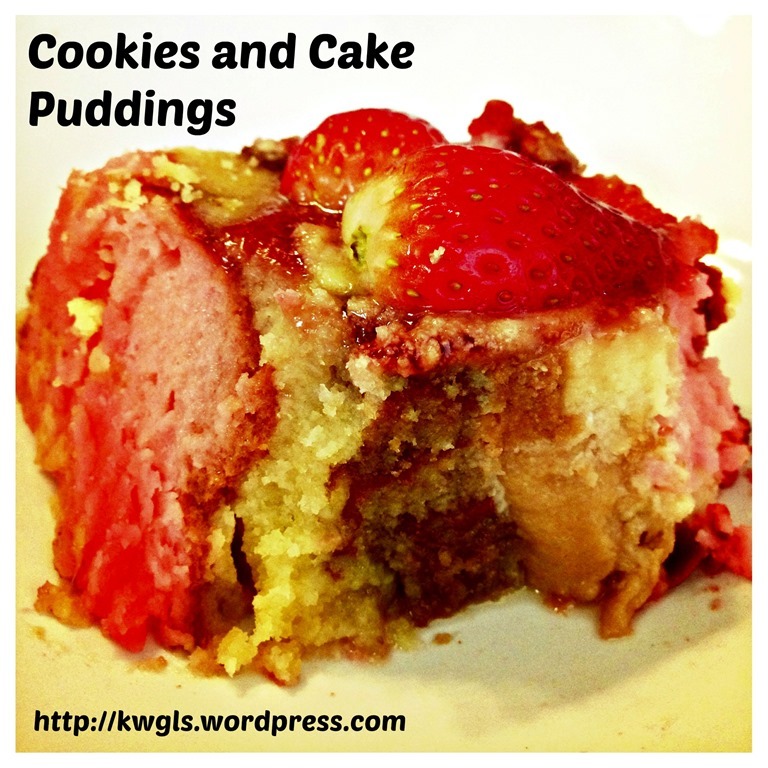 Thanks for sharing as part of Foodie Friends Friday Snack Party! What a stunning set of images. I really am in awe of your presentation skills.